To say it’s been a disappointing season for these two clubs would be an understatement, and neither had much to build off of from the end of last season. 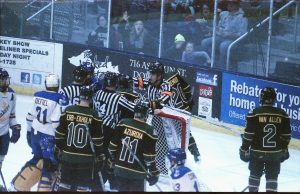 The Seawolves of Alaska Anchorage ended last season with 7 wins on the season, but have only won two contests this season – one coming from Lake Superior State and the other from Alabama-Huntsville, though to their credit they’ve also won three games in the shootout and somehow managed to tie North Dakota, then ranked #7 at the Ralph. It’s not hard to see why when looking at the stat sheet. They’re led in scoring by senior forward Austin Azurdia, who has 11-5-16 in 23 games this season. Following him you have (A)Tad Kozun, another senior forward with 5-8-13 in 27 games. In net you have the outstanding Olivier Mantha, now a senior he has played in all but 151 minutes, but has a 3.58 GAA and a .900 Save %. I say outstanding since, despite the team he has in front of him, he has played fairly well, peaking at a .913 Save % and a 2.82 GAA last season. He’s been the backbone of these Seawolves, having played in 118 games and totaling 6730:51 minutes in his career going into the final weeks of the season. He is currently #3 in the number of shots he has faced this season with 920 and has had to face 3671 shots so far in his career – it’s not wonder some of the scores get run up with nobody playing defense in front of him. While technically not out of the playoffs, as they could potentially catch up to Ferris State (they are 16 points behind), they’d have to essentially sweep the next three weekends & get a lot of help along the way. Everybody listening to the Bemidji State homers on the radio last weekend, or anyone following our coverage here at LakerHockeyBlog probably had the same sort of reaction to last weekend’s 4-goal shutout sweep of the Beavers: Excitement with a touch of anger or annoyance. The Bemidji State Beavers are a good team: they now have a 14-10-6 record, with one of the top goaltenders in the country backing them up, yet this Lake State team, led by forwards J.T Henke (9-16-25), Max Humitz (12-9-21) and Diego Cuglietta (7-14-21), and being backstopped by Nick Kossoff Friday night and Mareks Mitens Saturday night managed to pull off two 2-0 shutout wins, marking both the first sweep of the season, the first conference shutout of the year (they did shut out the USNTDP 6-0 in exhibition play), and also marked the freshman goalie Miten’s first collegiate shutout, facing and turning away 36 shots. Last weekend should power the Lakers into their final two series of the year: this week against UAA before going on a bye week, then traveling to Big Rapids to potentially fight for the final playoff spot. But what needs to happen to get there? The first step is that Lake State needs to sweep Alaska Anchorage this weekend in regulation, giving us six points totaling 27 on the season – one behind the Bulldogs. Ferris is off this week, but will face #5 Minnesota State-Mankato next weekend. We have to hope that Mankato does their job and sweep Ferris, leading up to a very interesting Friday night matchup on February 23rd, and potentially a nailbiter on the 24th. But even if the Lakers miss playoffs this year, having a late season surge in spite of one of their own getting into trouble around town should be a motivating factor going into next season, barring any early departures. Puck drops in Alaska at 11:07 ET and can be heard locally on 99.5 YesFM or on the web at yesfm.net. As always, you can view the games live on WCHA.tv.